August - Best Time to Travel in Costa Rica? August is probably our personal favorite month for traveling around Costa Rica. It’s “winter” on the Tico calendar but a tropical beach fits perfectly into the mid-summer routine for north Americans and Europeans. Let us know if you’d like some help planning an itinerary designed to take advantage of the August sun and surf in the mornings and afternoon/evening rains that green up the tropical foliage and cool things off. We happily trade a brief storm or two to avoid the premium prices and crowds around Christmas, New Years, Easter and Spring Break in the peak season. Both August and July typically have nicer weather than the months before and after. 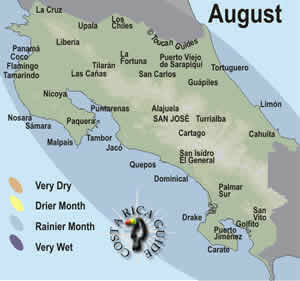 It is the middle of the rainy season but many years there is a lull in the rains starting in July and ending in August – especially in Guanacaste. Costa Ricans call this little dry season veranillo, and if you’re lucky you won’t need your umbrella at all on a visit to the northwest. The Caribbean side is creeping up on the sunny weather that’s normal in September and it’s one of our favorite destinations in August. The majority of the rain falls in the afternoon or overnight everywhere in Costa Rica. The hot August sun evaporates moisture from the sea and rain forest canopy creating a layer of warm moist air that rises as the day progresses. As the air rises it expands and cools causing the water to condense out forming clouds. Later in the day as the temperatures fall the air can hold even less water and some of it falls as rain. The rains are frequent enough to cool things off a bit on the beaches and in the lowlands with highs around 84 to 90 °F (29-32 °C) followed by overnight averages of 69 to 77 °F (21-25 °C). Average temperatures around the central valley are usually 75 to 85 °F (24-29 °C) this time of year and it cools off more at night. Input activities and what you want to see and the Costa Rica Time Machine outputs a where, when and how travel plan. In general “green season” (rainy season) vacations are gaining popularity in Costa Rica and August looks to be quite busy in 2018. If you want the flexibility of traveling without a fixed itinerary or reservations August is a good choice but we recommend advance reservations for the more popular eco-lodges and beach areas. Outdated info may suggest that August is a “low season” bargain but August has become one of the most popular months for travel and real discounts are few and far between. Airfare is generally cheaper when purchased in advance but August is often featured in last minute sales. It’s worth setting a notification six or eight months in advance on a fare watcher site like kayak.com if you’re thinking about heading down in August. If your vacation time doesn’t fall in August try July – it has similar weather (slightly drier), the big surf swells and some of the low season discounts. May, June and November are also alternatives, each with a little more rain but even fewer people. In in June through August we miss the long summer days up north. Costa Rica has 12 hours of light since sun rise and sun set are about 6 o’clock year round in the tropics. If you’re planning to rent a car you might want to take a look at the rainy season driving tips. NOAA projects that the El Niño will fade in the second half of 2019 giving way to a La Nada pattern (El Niño Southern Oscillation – Neutral) which means weather will be extra unpredictable. The more you see of a turtle, whale or quetzal symbol the more likely you’ll see one. A detailed explanation and legend is also included at the bottom. Virgen de Los Angeles – National holiday celebrating the patron saint of Costa Rica, La Negrita. Special masses and a religious procession from San José to La Basilica de Cartago. Pilgrims come from all over the country, many on foot to celebrate the mass at Cartago.